Just one month after council's unanimous vote for "TO Prosperity", the City's poverty reduction strategy faces a funding shortfall. City staff present the 2016 Preliminary Budget to the Budget Committee and visiting councillors. In early November, city council unanimously voted in favour of a sweeping 20 year plan to rid Toronto of poverty. The strategy, dubbed TO Prosperity, would address the scourge of damning reports exposing Toronto’s mounting inequality, precarious employment, lack of social housing and general unaffordability. Everyone was on board, at least in principle, to tackle the problems weighing on our most vulnerable citizens. When City staff presented the preliminary 2016 municipal budget on Tuesday, however, some council members balked at how little focus, and funding, was allocated to reducing poverty, and council will likely focus on whether and how to fund the plan over the next two months. While there is a $4 million increase for annual poverty reduction programs, staff flagged $6.5 million for new, unfunded services needed to help kickstart the strategy. These services did not make it into the draft budget. The $6.5 million is a slice of the $67.4 million in “new and enhanced” recommended or promised services—like the Mayor’s TCHC task force recommendations from July, 24-hour winter shelter drop-ins and the chronically unfunded parks plan—that have no financial backing despite direction from various agencies, boards, and committees. Now staff has put it to council to decide which initiatives (if any) should make it into the final budget and how they should be funded. Council may well lock down the $6.5 million for poverty reduction, but advocates of TO Prosperity say that’s not enough. On the eve of the budget, 50 different community leaders and organizations signed a joint letter urging council to adopt 49 recommendation they consider essential to the poverty reduction strategy. The letter reflects the needs of hundreds of residents with lived experience of poverty and who participated in consultations to draft TO Prosperity. Together, they propose divvying up $75 million between four priority areas: jobs, children, housing, and transit. Recommendations include allocating $15.6 million to supportive housing for 1,000 individuals and families, and $14.5 million to create 7,000 more affordable housing units. $3.6 million would go towards doubling access to after school childcare programs, and $5 million would help create 1,551 more subsidized daycare spaces over five years. Another $17.4 million would help cut transit rates for people on OW and ODSP by 2018, and $2.1 million would support programs helping low-income people navigate the system through tenant hotlines and financial literacy programs, for example. Funding the $6.5 million Poverty Reduction Strategy gap from property taxes would require a 0.25 per cent increase in residential revenue. This works out to an average of $6.50 per household. Deputy Mayor Pam McConnell (Ward 28, Toronto Centre-Rosedale) pointed out at Tuesday’s committee meeting that there are some budget items aside from the allotted $6.5 million that may also help ease poverty. Those include $39 million for affordable housing, $13.8 million for social housing renovations and $2.7 million for community infrastructure projects in low-income areas. Depending on how you frame it, poverty reduction spending could reach up to $80 million. The problem is that few of those items are new or innovative solutions to systemic poverty—rather, they represent existing funding and policies council already decided isn’t enough. At the meeting, councillor Gord Perks (Ward 14, Parkdale-High Park) called the preliminary budget “dangerous” in part for leaving too many critical items unaccounted for. On top of the unmet needs cost for 2016, staff identified a $57 million gap in the operating budget. Closing that would require hiking property taxes 2.17 per cent (beyond the 1.3 per cent inflation benchmark Mayor Tory promised to stick to), which would still do nothing about the remaining $67.4 million. 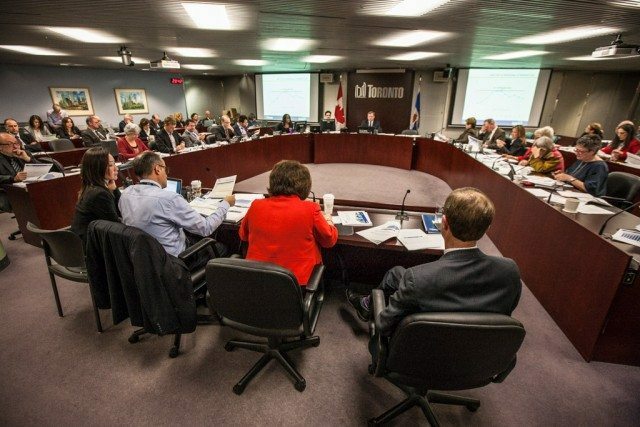 Starting in January, council and the public will get the chance to debate and influence the budget through council briefings and community consultations across the city. The final budget will be decided on February 18.